What is a refurbished phone? Refurbished phones come under either one of two categories- a faulty phone sent back to the company or one sold on from the previous owner, usually not in the original packaging, with any repairs and damages restored back to original working order. If you have purchased the phone from a reputable source, they tend to have been tested and come with a warranty, just like a brand new phone. When retailers refurbish a mobile phone, they give it one of three 'grades': A, B or C. Grade A is usually issued when a phone appears new or has very minor, insignificant signs of use. Grade B means the phone has some scratches, chips or other signs of use and wear. It will look like a used, second-hand phone when the customer receives it. Remember to be careful when shopping for refurbished phones, and always make sure to check the description to see what Grade the phone comes under. How much does it cost on average to insure a refurbished mobile phone? Many major network providers do insure refurbished phones, but only those bought directly from them. Many providers will not offer insurance for phones bought from third party websites, such as eBay. 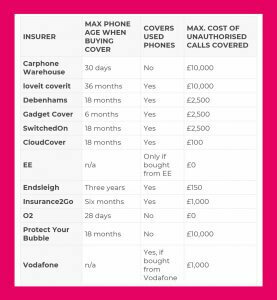 Whilst some networks offer a separate refurbished phone section, such as o2 Refresh (£6.00 to £12.50 a month for insurance) and Three’s Clearance Refurbished Phones, the price for insurance is usually relatively similar to purchasing a new phone from a network provider. However, there is the added benefit of purchasing a cheaper phone when it is refurbished, so it could could be the best or cheapest option for some. What’s the difference between insurance for new phones and insurance for refurbished phones? Many providers only insure certain refurbished phones and not those purchased from auctions. On the other hand, brand new phones can be insured with little restrictions and from the most providers or companies. There are advantages and disadvantages for both refurbished and new phones; you just have to find the option that’s right for you. Most home insurance policies that include insurance of mobile phones also insure second-hand or refurbished phones. There are no separate terms and conditions for these devices. Most networks do not cover insurance for second-hand phones, as they want you to purchase their phone along with their insurance. Out of all the networks, o2 and Three offer a refurbished phone and insurance option. Some dedicated insurance providers insure refurbished mobile phones, but only if they have bee purchased directly from the manufacturer or from a mobile network provider. Most will not insure it if it has been purchased from a website such as eBay or from an auction. What buying rights do you have when purchasing a refurbished phone? You have the exact same rights buying from a trader as you do when purchasing your phone in a shop. If you find a fault that the seller has not disclosed, you have the right to send it back for a full refund. How much could you save when purchasing a refurbished phone? When purchasing a refurbished mobile phone, the handset is often free unlike new mobile phone contracts requiring an upfront cost for the handset as well as the contract fee. The refurbished phone deals usually do not offer as many gigabytes of data per month, with the highest being 6GB via a mobile insurance provider, which could be a crucial factor for some. However, if saving money per month on a phone that is less than a year to a couple of years old is important for you, a refurbished phone could be a great option. To get a quote for your refurbished device visit our mobile phone insurance page.